I am a great lover of to-do lists. The satisfaction of crossing something off for me is a high, so much so that (don’t tell anyone) from time to time I may have written a few things on the list that I had already completed just for the pleasure of crossing them off. I keep my to-do list on my counter where I can jot down anything that comes to mind and not forget that I want to do it. Occasionally this has meant that my to-do list is longer at the end of the day than at the beginning, as I’ve kept adding things all day but only been able to get a few of them done. The problem with this of course is that with a mile-long list we have so many options for things to do that when we go to choose what’s next we might not be choosing the most important thing. Maybe we tackle the little stuff first because it feels easier to get motivated to do those. Maybe we only take on tasks that take a few minutes so that we can cross more things off – the whole quantity over quality game. Even though we feel really busy it can also feel like we’re treading water. As if we’re crossing things off but not really making any substantial progress towards anything. Here to help is the idea that less is more. We’ve all heard that phrase before and it applies to your to-do list too. Instead of haphazardly jotting down everything on your list that comes to mind (as I so often have in the past!) you write down only the three most important things to get done each day. This helps you to focus on the really important stuff and not feel pulled in so many directions. If you don’t want to loose all of those other great ideas you might keep a separate place for writing them down and you might even get to some of them. But each morning when you are planning your day try to think about what three things will move you in the direction you want to go the most and focus on getting those done first. To take this even one step further, I think it’s helpful to spend some time identifying not only what’s really important to us in our lives as far as what we want to get done – but also how it is that we really want to feel. You can cross every last thing off of your list but if you are completely stressed out and unhappy the whole time than what is the point! The majority of this whole life experiment takes place inside our heads. I know that might sound a little silly as we physically move through the day but our mind is always filtering, always analyzing, labeling, interpreting, seeking. It’s also extremely creative. If we give it a task instead of letting it run loose wherever it feels like it will often come up with the solution. So if at the beginning of each day we can set an intention not just for what we want to get done, but also for how we want to feel – energetic, positive, friendly, loving, confident, calm, present, creative – your mind now has a job to do alongside your physical body. Each time you feel yourself drifting off to another place, maybe feeling frustrated or overwhelmed or upset about something the trick is not to beat yourself up about it but instead to acknowledge it, allow it, and then remind yourself of the intentional feeling that you set for the day. Take a deep breath and reset. If you can do these two things; 1) Limit your to-do list to only the most important 3 things and 2) Set an intentional feeling for the day, you will be a powerhouse! Getting the most important things done and also feeling the way you want to feel. 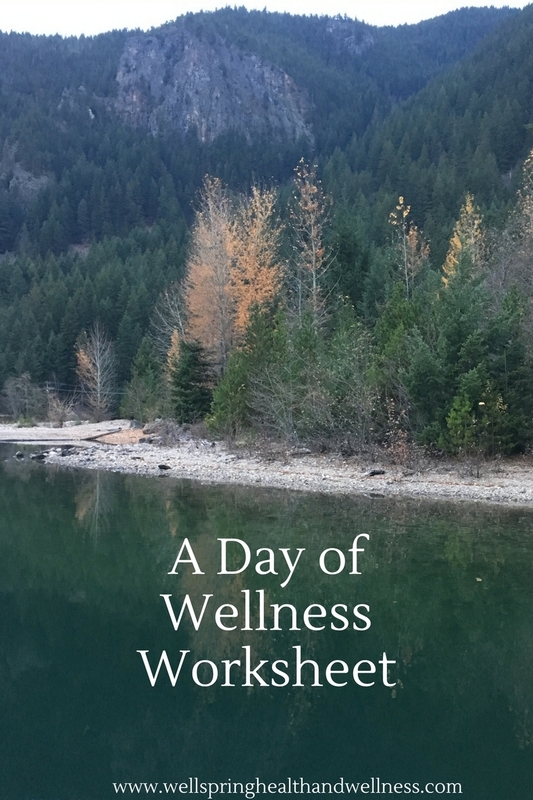 If you would like a little help in setting your day up in an intentional way that will help serve your health and wellness you are welcome to use my free Day of Wellness Worksheet for inspiration – just click on the image to download it. It’s intended to take just a few minutes each morning to help you focus on what’s important. I hope you have a beautiful intentional day!